Today we are going to discuss about draft tube. Draft tube is a connecting pipe of constantly increasing area, from runner exit to tail race. Draft tube is one of the important parts of a hydro turbine, which is used to transform water into energy. To transform dynamic pressure to static pressure. With its increasing area helps in reducing cavitation effect. To convert residual kinetic energy of flowing water from rotor outlet into pressure energy. Cavitation bubbles block flow of water through reduced cross section area. Erosion of material with short lifetime. In this type of draft tube the shape of the tube is elbow and the cross section area remains same throughout the length of draft tube. The inlet and outlet of the draft tube are circular shaped. Used at the places of low head. Used when the turbine is to be placed close to the tail race. Efficiency of this type of draft tube is about 60%. 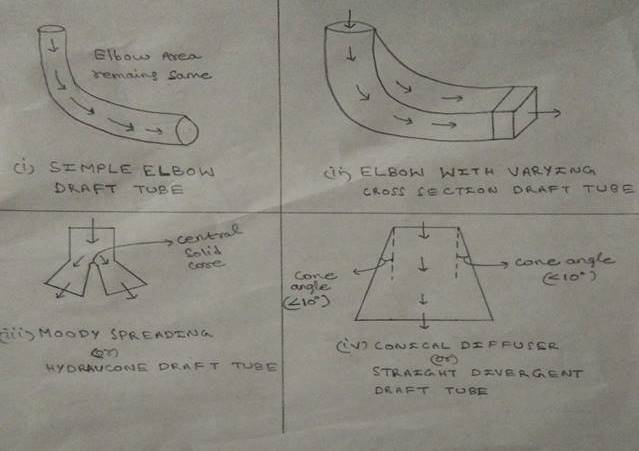 It is an improvement of simple elbow draft tube. In this type of draft tube the inlet is circular shaped and where as the outlet is rectangular shaped. The cross section area changes from circular to rectangular from inlet to outlet. Outlet of draft tube should be suited below tail race. Generally used in Kaplan turbine. Efficiency of this type of draft tube is about 70%. In this type of draft tube there will be one inlet and two outlets. Inlet and both the outlets of draft tube are circular. The central solid core will divide both the outlets. Used for reducing swirling action of water. Efficiency of this type of draft tube is about 88%. In this type of draft tube the flow path way is straight and divergent. Cross sectional area varies from beginning to ending of draft tube. It is used for low specific speed and vertical shaft Francis turbine. Cone angle is less than 100. If the cone angle is high cavitation occurs. Efficiency of this type of draft tube is about 90%. The main function of draft tube is to decelerate the velocity and increase the pressure of the fluid flowing from the runner exit to tail race. Water enters into the penstock and strikes the turbine vanes and reduces its pressure. To reduce the velocity of water and to increase the pressure of water before entering the tail race a pipe of gradually increasing cross sectional area is used. Draft tube increases the pressure of water to the atmospheric pressure. y = distance of bottom of draft tube from tail race. Pa = atmospheric pressure of fluid. Pressure head at section 2 – 2 is equal to atmospheric pressure head and distance y. In the above equation [ ( V12 / 2g ) – ( V22 / 2g ) – hf ] is called kinetic head. Here [ ( V12 / 2g ) – ( V22 / 2g ) ] is the dynamic head. Pressure head at inlet of draft tube or outlet of turbine is less than the atmospheric pressure. So the net head on turbine with draft tube is increased. Efficiency of draft tube Ƞd = Actual conversion of kinetic head into pressure head to the kinetic head at inlet of the draft tube. 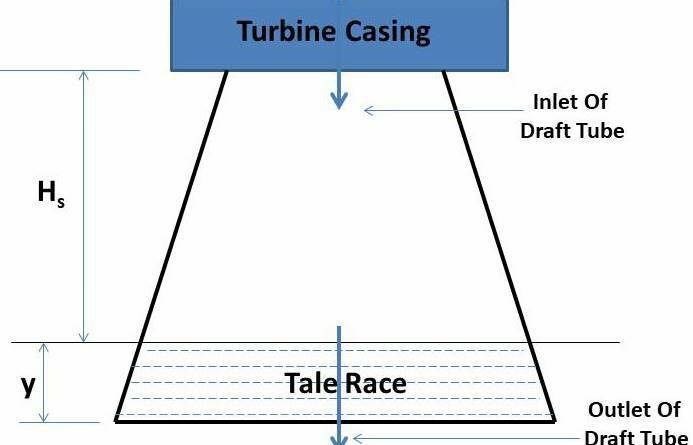 In turbines with low head especially in reaction turbines the pressure of water at runner exit will be less than atmospheric pressure. The pressure of water drops to sub atmospheric pressure. But the water outside is having a positive pressure of atmospheric pressure (chance of air entrapment and could cause cavitation). In practical significance water flows from higher pressure value to lower pressure value. There may be a chance of water to enter into tail race from its exit. This will cause the turbine fail to work. To convert large portion of kinetic energy rejected at the outlet of turbine into pressure energy to reduce losses. Provides negative head at the outlet of the runner to increase the net available head on the runner. 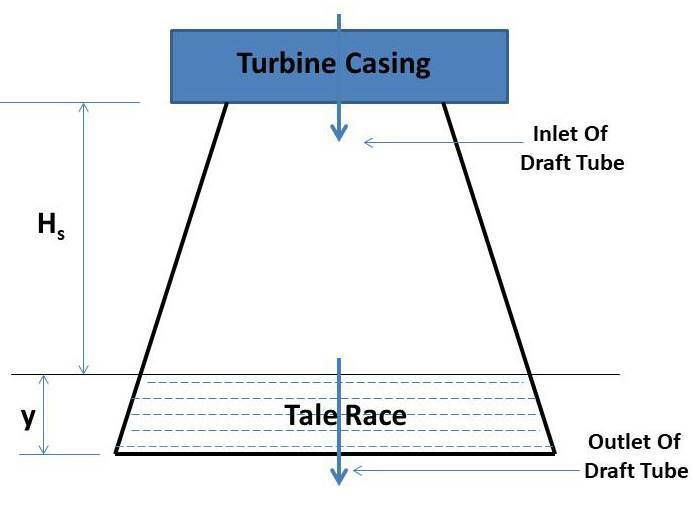 Turbine may be placed above the tail race without any loss of net head. Prevents the splashing of water coming out of runner and guides the water to the tail race. 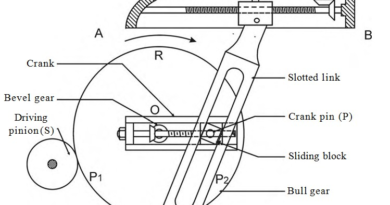 The word “TAPERED” is incorrect “GRADUALLY INCREASING AREA OF CROSS SECTION” is correct. Gradually or Constantly increasing area means constantly decreasing velocity that means constantly increasing pressure. The efficiency of draft tube depends upon the shape of the draft tube. Pressure at the exit of runner is suction pressure and it should not be reduced to vapour pressure. This is all about draft tube types, purpose, function, efficiency etc. If you have any doubt ask by commenting. If you like this article, don’t forget to share it on social networks. Subscribe our website for more informative articles. Thanks for reading it.